Has anyone tried http://www.lindyschili.com/locations.html pork tenderloin? I just noticed a brand new sign going up for Lindys near Harlem and 167th street, Tinley Park. I am headed to the Des Moines area for the holiday weekend and will have to hit up a few of these spots. In preparation of my trip to Iowa I have prepared a Google Map of the first two pages of his blog. There are some highly rated places in the Des Moines area and I am looking forward to the trip! Panther in the Den : Sweet...the trip up there is sounding good! Pnking : I did spend some time on http://breadedtenderloin.wordpress.com/about/ thanks for the tip. All of the joints listed are in Indiana, I could not find any in Illinois. Let me know if you need anything specific in Des Moines/Central Iowa. Thanks for the offer! Maybe someone to share a meal and a review with. On my map, the 4 closest places to Des Moines are listed below. Have you been to any of these places? Any recommendations? I run the Des Loines blog, If you need something in a specific part of Central Iowa, or a place that has a certain kind of menu for whoever you're with. If you just want to eat one tenderloin in Iowa, hit the Augusta Restaurant in Oxford, just past Iowa City. If you want a ridiculous over the top sandwich at a family friendly small town ice cream place, hit Goldies in Prairie City, just 10 miles off I-80 on the way to Des Moines. Last edited by Tyrgyzistan on January 11th, 2011, 11:52 am, edited 1 time in total. Is...is that a breaded pork tenderloin sandwich, topped with ham and bacon? Please, excuse me for 300 miles, er, a moment. Tyrgyzistan wrote: I run the Des Loines blog, If you need something in a specific part of Central Iowa, or a place that has a certain kind of menu for whoever you're with. If you just want to eat one tenderloin in Iowa, hit the Augusta Restaurant in Oxford, just past Iowa City. If you want a ridiculous over the top sandwich at a family friendly small town ice cream place, hit Goldies in Prairie City, just 10 miles off I-80 on the way to Des Moines. First off... Thanks for your work on your blog site! Very nicely done with the awesome pictures and descriptions that make me yearn to head out there early. Secondly... Thanks for stopping by our little corner of the Internet and stepping up with your recommendations! I will be taking your recommendation of the Augusta Restaurant. My Bride and I do not have to be in the Des Moines area until dinner time and I will make sure we allot enough time to stop. I have added the restaurants you mentioned in your post above to my Google map as well as the ones mentioned in the sidebar on your site. I figure I will be color coding the pins based on rating (to help me choose when driving through). I am hoping to try at least one a day while I am out there and The Jethroe has moved up the list as I would like to try some variety. We will be visiting Ames also during the trip so The Suburban Restaurant might also be on the menu. Thanks again and Have Fun! I think you are going to have to call places to make sure they are open on the holiday weekend. The small town diners or family owned places have short hours and take holidays off most of the time. I have been working with Tyrgyzistan to get more places on The Google Map. The pushpins have also been colored to reflect the ratings of the restaurants. It's going to be a fun (and tasty) trip to Iowa. I went to The Silo Monday night and tried their BPT for the second time. The first time I thought it was only ok. This time it was just bad. It is very, very, big and was very, very bad. It had only a small piece of pork inside the breading and lucky for me it was so big, because they burned the outer edges of the breading. So after cutting off the entire edge of the sandwich there still was a lot left, but I was still disappointed. I just don’t understand why someone would put so little meat in this and not expect the customer to notice. If you are a fan of the BPT I would not recommend this place. A small nice touch was I could substitute breaded mushrooms for the fries. I did this, but they were only OK. I still miss the ones that Brown’s Chicken used to make. Felt like a BPT yesterday. About the only convenient source is the local Culvers. A serviceable sandwich- big enough to overlap the bun by an inch, mild porky flavor and the appropriate toppings. It wouldn't be near the top of the heap in Iowa or Indiana, but when I need a BPT fix, a Culvers will do the trick. 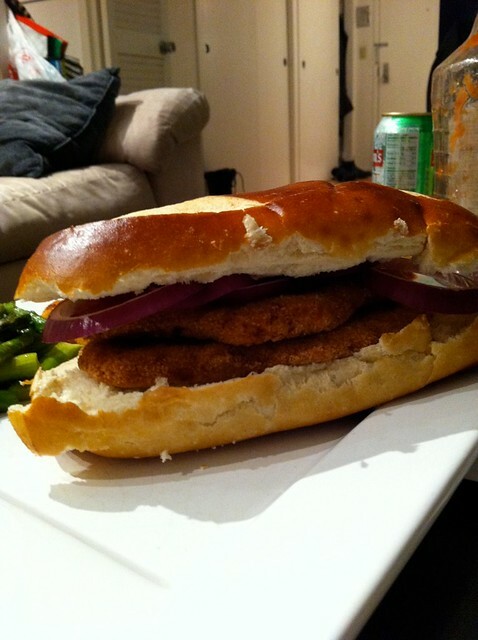 Cbot wrote: Has anyone tried http://www.lindyschili.com/locations.html pork tenderloin? The place in Tinley Park does not have the BPT on the menu. Went there a fews weeks back and just called now to triple check. Bummer! That is what I am talking about! Only in Iowa. I am fortunate enough to be heading to Iowa over New Years and I am going to detour to snack on this baby. I had the Lindy's BPT sandwich. It seems like an food service tenderloin. It won't offend, but it won't make you forget Iowa. Chef Klaus in Mokena or the big one in Frankfort. Great breaded Pork and Veal tenderloin. Great staff at the one on 191st. A pleasure to dine there. dramisino wrote: Chef Klaus in Mokena or the big one in Frankfort. Great breaded Pork and Veal tenderloin. Great staff at the one on 191st. A pleasure to dine there. Care to elaborate as to where "there" is? I just noticed a brand new sign going up for Lindy's near Harlem and 167th street, Tinley Park. The place in Tinley Park does not have the BPT on the menu. Went there a few weeks back and just called now to triple check. Bummer! thick wrote: I had the Lindy's BPT sandwich. It seems like an food service tenderloin. It won't offend, but it won't make you forget Iowa. I was setting up a at-home date night 1-2 punch last Friday for a My Bride of Kevin's hamburgers and Lindy's chili and while at Lindy's I did notice the BPT on the menu and ordered one. While it did not make it into dinner that night it did make an appearance in My Brides famous leftover meat and scrambled egg weekend breakfast. The meat was tender and the breading mild. A sprinkle of salt brought out some more of it's potential. Not bad. I will have to stop by and try one right out of the fryer. Side Note: The chili at Lindy's was awesome! I ordered a pint of both the meat and w/ bean and it had just the right amount of chili flavor. Nice touch of heat without any additions. The w/ bean could of used more beans though. I thought I'd mention that my friend tried the BPT at The Silo in Lake Bluff last week. It looked like a classic, Iowa-style sandwich. He said that it was decent, a bit dry and maybe a little bland, and he'd probably stick to the pizza there. This may have been mentioned upthread, but the Silver Palm's legendarily enormous Three Little Piggy sandwich is made with pork tenderloin (as well as Virginia ham, thick-cut bacon, a fried egg and gruyere). 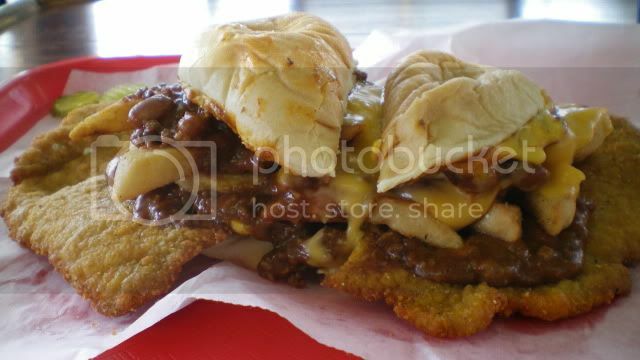 The Milanesa sandwiches served at Cemitas Puebla (and other Mexican restaurants) made from boneless pork chops that have been pounded, breaded and fried - not the same as tenderloin but the same idea. 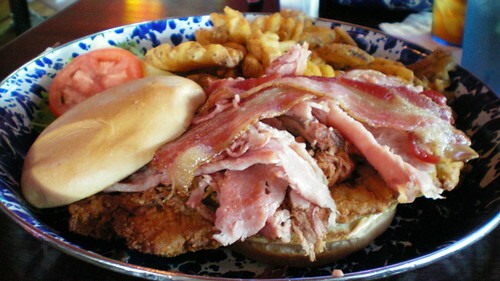 ld111134 wrote: This may have been mentioned upthread, but the Silver Palm's legendarily enormous Three Little Piggy sandwich is made with pork tenderloin (as well as Virginia ham, thick-cut bacon, a fried egg and gruyere). Start with a pork tenderloin, add Carolina style pulled pork, house smoked pit ham, and a double order of thick slab bacon. The tenderloin was good if a touch dry, pulled pork very good with a nice smoke flavor, the ham was honey sweet which conflicted a tad and the bacon great. The flavors were doing battle with each other and it would be difficult to get the right balance. Interesting experience though! Felt right at home with a strong presence from Goose Island Brewery. Thanks to The Des Loines Blog for the tip! ala carte or full dinner ---- or as a hot sandwich with gravy and potatoes.. If you just want the Tendorloin and are going with someone else who might want something different... then go before 9 pm -- there's always a TON of specials on the menu - and trust me when I say a TON of specials ! ! ! I've been eating here for 25 years at least and I must order that more than anything. I'll go with other specials.. and I've never had anything bad. But if I can't decide on anything else... I just know the Pork Tenderloin is always GOOD, and filling - - - and reasonable ! ! ! 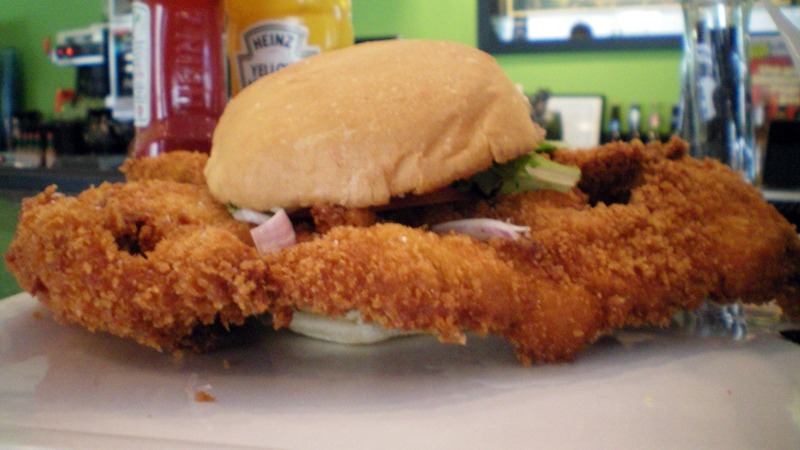 located On York road about a block south of North ave.
Nice play by play pic of the breaded pork.. .sandwedge looks GREAT! Do they sell them year round and whats the cost? I think it might be time to update this thread. I’ve been doing research lately and have visited a couple of places. 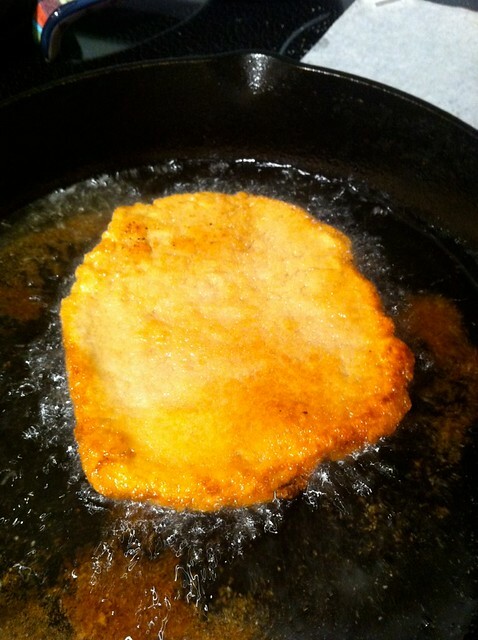 Breaded pork cutlet. Asian BBQ. a pretzel bun with a side of curry ketchup. My Bride always gets the BPT and with some recent activity on a group on Facebook I went with it too. As many know almost all Eastern European restaurants will have Pork Tenderloin on the menu and often a huge plate full. Getting the often grumpy waitress to get a bun and toppings will be the challenge. 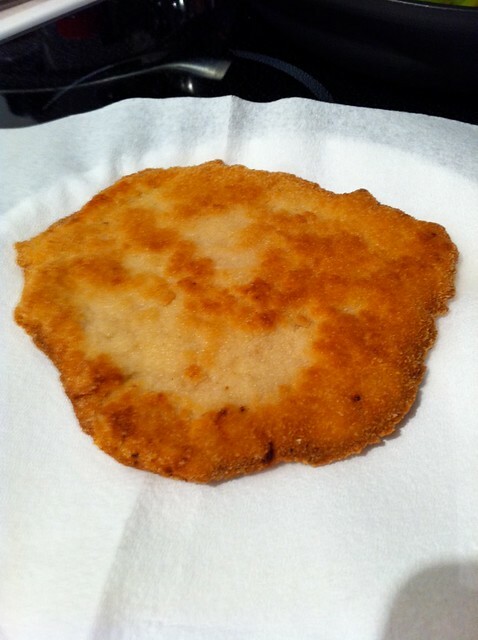 This one was very good as they often are, tender, juicy with a tasty breading. I did deconstruct it prior to eating. I will be a little more assertive next time and get the bun.